Thomas Alexander Bailey (born 18 January 1956) is an English singer, songwriter, composer, musician, and record producer. Bailey came to prominence in the early 1980s as the lead vocalist for the new wave band Thompson Twins, which released five singles that entered the top ten charts in the United Kingdom during the 1980s, including "Love On Your Side", "We Are Detective", "Hold Me Now", "Doctor! Doctor! ", and "You Take Me Up". He was the only classic member of the band to have formal musical training. From 1994, Bailey was also a member of its later incarnation, Babble, releasing two commercially unsuccessful studio albums. He currently works in various musical fields including scoring for film. He records and performs dub music under the name International Observer and Indo-fusion music with the Holiwater Project. His latest collaboration is the Bailey-Salgado Project (BSP), an audiovisual ensemble formed with José Francisco Salgado. Tom Bailey grew up in a family associated with the medical profession. His father was the Medical Officer of Health for Chesterfield Borough Council, and Bailey was educated at Chesterfield Boys' Grammar School. A "whole school" photograph from April 1969 shows him at age 13 (4th from the extreme left in the second row). Despite training as a classical pianist, Bailey initially worked as a music teacher at Brook School, Sheffield. In his late teens and early twenties, he travelled the world. 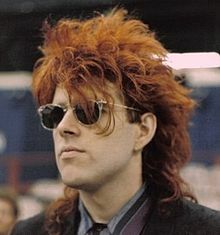 Bailey formed the Thompson Twins in 1977 with Pete Dodd (guitar/vocals), John Roog (guitar), and Jon Podgorski (drums). Podgorski did not want to move to London, so Andrew Edge played drums with them for one year before Chris Bell joined. The group eventually ended up as a trio with Bailey on vocals, guitar, bass, and keyboards, his then girlfriend Alannah Currie (percussion, saxophone, and vocals), and Joe Leeway (percussion and vocals). The Thompson Twins became fixtures on MTV during the 1980s as the videos for "Hold Me Now", "Lay Your Hands on Me" and "King for a Day" were played frequently. Subsequent to the marriage of Bailey and Currie, Thompson Twins released their final album, Queer, in 1991. In 1994, Bailey and Currie formed the electronica-orientated duo, Babble. Between 2001 and 2015, Tom Bailey released several dub/electronica albums under the name International Observer. Also in 2014, Tom Bailey took part in the Retro Futura Tour in the USA. He was billed under the moniker "Thompson Twins' Tom Bailey." The 2014 Retro Futura Tour also featured Howard Jones, Midge Ure, China Crisis, and Katrina Leskanich of Katrina and the Waves. In 2018, Bailey toured with The B-52s and the Culture Club as part of The Life Tour. The tour dates were June 29-October 5. In 1988 Bailey collaborated with Phil Thornalley, who worked frequently with the Thompson Twins, on Thornalley's only solo album, Swamp. Aside from playing instruments, Bailey also produced three tracks, remixed three tracks along with Thornalley and co-wrote the track "When I Get to Heaven". In 1999 Bailey produced the New Zealand band Stellar, and in 1999 he won Record Producer of the Year in New Zealand for their debut album, Mix. In 2002 Bailey became the figurehead for the dub project International Observer. Recent performances with 'Holiwater', a cinematic fusion of Indian classical music (Sarod- Vikash Maharaj), electronica (keyboards – Bailey) and video (film maker – Andrei Jewell), blur boundaries between art installation and performance. The band was formed to highlight issues of water pollution on the Ganges. In 2010 Bailey and astronomer and visual artist José Francisco Salgado formed an audiovisual ensemble called Bailey-Salgado Project (BSP). BSP combines music with photography, video, and motion graphics to create multimedia works that have as subject the physical world. Their first work together, a short film entitled Sidereal Motion, was previewed in Bath, England in October 2010. Tom was married to fellow band member Alannah Currie from 1991 to 2003. They have two children, Jackson (b. 1987) and Indie (b. 1992). As of 2014, Bailey lived in France with his second wife, artist Lauren Drescher. He has homes in New Zealand, France, and London. Bailey has been vocal about his choice to be a vegan. He does not drink or use recreational drugs. ^ a b c d Sutton, Michael (18 January 1956). "Tom Bailey — Music Biography, Credits and Discography". AllMusic. Retrieved 16 March 2013. ^ "Phil Thornalley — Swamp (Vinyl, LP, Album) at Discogs". Discogs.com. Retrieved 16 March 2013. ^ "Swamp — Phil Thornalley : Credits". AllMusic. Retrieved 16 March 2013. ^ "Thompson Twins — The Bubble Burst — Where are they now?". The Bubble Burst. Archived from the original on 10 December 2007. Retrieved 16 March 2013. ^ "INSAP VII speaker — José Francisco Salgado". Insapvii.org. Retrieved 16 March 2013. ^ Alper, Eric (10 August 2014). "Tom Bailey Of The Thompson Twins On Coming Back, MTV and His Favorite Song". ThatEricAlper.com. Archived from the original on 31 May 2015. Retrieved 30 May 2015. ^ a b Stephens, Stephanie (17 July 2018). "Thompson Twins' Tom Bailey: Gives '100 Percent' to New Music, New Tour". Parade. Archived from the original on 19 July 2018. Retrieved 12 September 2018. This page was last edited on 31 January 2019, at 02:40 (UTC).